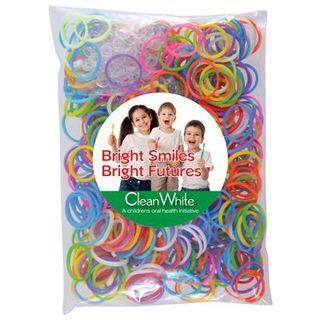 500 synthetic rubber loom bands with 20 sets of ‘s’ and “c” clips packed in clear polybag. Use to create colourful bracelets, jewellery, pencil toppers, keyrings, flowers, animals, action figures....the possibilties are endless. Get crazy with logo loom! Loom not included. Great for Children's Events, Direct Mail, Event Merchandise, Fetes & Festivals, Point redemption programs, Cafes & Restaurants, Charities & Organisations, Councils, Cultural, Education, Retail, Tourism!